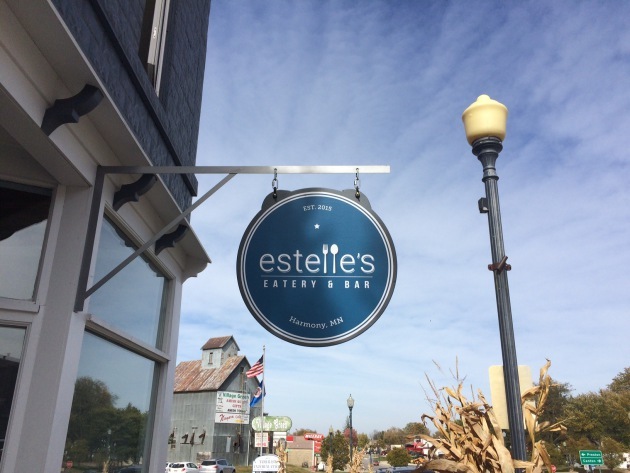 Burger Friday: An autumn-leaves daytrip to Estelle's Eatery & Bar in beautiful downtown Harmony, Minn. The burger: For those who tally food miles – that’s the distance logged between farm and table – the journey that the burger takes at Estelle’s Eatery & Bar in Harmony, Minn., is surely one of the shortest on record. And that freshness is evident in every quality-laden, deliriously delicious bite. 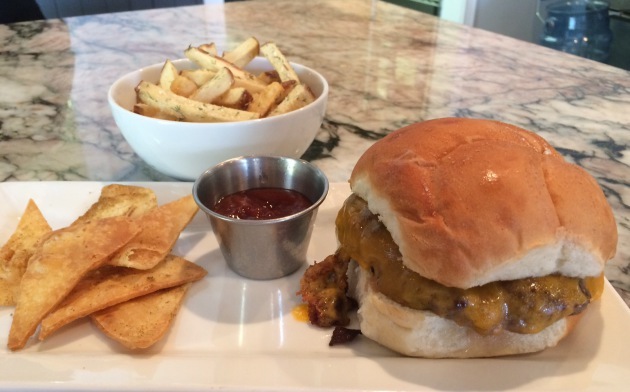 OK, there's one hitch: Twin Cities diners will have to drive about 130 miles to enjoy it. Outwardly, this burger could be filed under “no-nonsense,” as it’s little more than patty, cheese and bun. First impressions are often deceiving, because when it comes to this burger, there’s a lot more going on than meets the eye. For starters, the weighty patty – it clocks in somewhere between a third-pound and a half-pound – is the stuff that burger dreams are made of. What a spectacularly rich and flavorful grind, a well-balanced blend of sirloin, chuck and flank. Naturally, it doesn’t travel far on its journey from farm to chef/co-owner Matt Brown’s kitchen. A Harmony farmer raises Black Angus cattle, and the animals are processed to Brown’s specifications in nearby Eyota, Minn. What a smart food chain: diners benefit not just in terms of quality control, but also in economics. “We’re cutting out the middleman, and putting the savings right back into the burger,” said Brown. (Don't believe me? See '"Price," below). Because he cut his culinary teeth as a member of the excess-is-our-middle-name crew at Travail Kitchen & Amusements (more on that in a moment), Brown isn’t content to leave well enough alone. That’s why you’ll find him paddling additional beef fat into that first-rate grind. Then he reaches for the salt and pepper (and hints of garlic and shallot) before forming notably thick patties that tend to hang, muffin top-style, over the bun's edges. They’re grilled on a flattop, nurtured to a just-right spot between medium and medium rare. The results are melt-in-your-mouth tender, and the patty’s surfaces leave the stove with just enough sizzling, caramelized char to introduce another layer of bold, beefy flavor. The sole embellishment is a sharp, melty Cheddar (with beef this good, nothing more is required). The whole shebang arrives on a Kaiser bun (baked to Brown’s specifications at a nearby supermarket) that’s sturdy enough to hold up to that juicy, heavy patty. The bun gets a little brush of olive oil and a quick toast on the stove, and it’s perfectly suitable, if a little on the dull side. But high on Brown’s to-do list is taking the bun production process in-house. “It’ll be our own,” he said. Harmony is roughly two hours southeast of the Twin Cities; the Iowa border is practically visible from the restaurant's front door. It’s an easy, wonderfully scenic drive, particularly during this year’s spectacular autumn-leaves season. Is this burger worth the trip? Absolutely. The skin-on cuts are blanched in water that’s fortified by dill, caraway and thyme, and then fried until they’re still pale and just barely suggesting a golden hue. They’re firm but not what you’d consider crisp, and when you break them open, they’re wonderfully starchy. And generously seasoned, too, with tons of kosher salt and fresh dill. A full order is $5, a half-order (pictured) is $3. No kidding. The lunch menu’s top price is $10 (expect well-composed sandwiches, salads, soup and a single pasta entrée), and dinner – a few house-made pastas, steak and potatoes, a pork chop -- doesn’t go further north than $16. A bar's dozen taps favor Minnesota craft labels (Fulton, Bad Weather, Lift Bridge, Surly, along with 1919 Root Beer) and there’s a long list of bottled and can brews, too; the selection would be the envy of any south Minneapolis gastropub. Why Harmony? For one thing, it’s Heidi’s hometown. But it’s more than that. “We like it down here,” said Brown. “We got married here, and we came down here once a month just to chill out.” The issue that set the move in stone was the birth of their daughter, Estelle, now 3 months old. “We want to raise our family here,” he said. They’ve been welcomed with open arms, he said. To dispel any notion that the restaurant business is a cakewalk, consider this schedule: for three months, Brown compressed a 40-hour work week into three days in the kitchen at Arezzo in Minneapolis, then spent the next four building out his restaurant. The couple took over what had been the Intrepid Traveler, a pastry-sandwich shop that had been shuttered for a decade. “It was nothing but bare walls, and a floor,” said Brown. “That made it a nice, big, open canvas, and that was great.” It helped that it wasn’t his first restaurant construction job – he’d pitched in when Travail moved to its new home – and when he didn’t know how to do something, he’d turn to YouTube for a tutorial. Along with the help of a few handy friends, the place came together, a long, narrow, sun-filled storefront now dominated by a handsome marble-topped bar, some comfortable booths, periwinkle walls, a reclaimed wood ceiling and enough gleaming tile to cover several Parade of Homes McMansions. 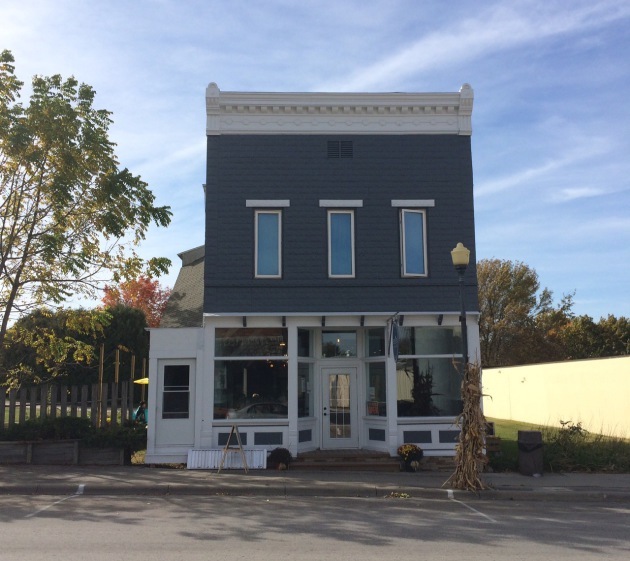 Don’t miss: To get a sense of how Brown is transforming the culinary scene in this Amish-centric town (when I pulled into town, I stepped out of my car and into a postcard as I watched a horse-drawn buggy drive past), diners need only order his superb squash soup, a memorably amusing pop of Travail culinary shenanigans in Fillmore County. “I started at Travail four years ago, that’s where I went to culinary school,” he said. That’s quite an education. Brown, with no previous restaurant experience, left his job at a construction company in Phoenix and returned to Minnesota (he grew up in Prior Lake) to work for his brother Mike, one of Travail’s three chef/owners. “I fell in love with it,” he said. He later spent time co-managing Travail’s kid brother, Pig Ate My Pizza, and also behind the bar at the Rookery, Travail’s ultra-craft cocktail bar. “It’s pretty amazing that they let me partake in that huge, awesome restaurant,” he said. (Heidi is no stranger to the industry, either, with a long stint in the front of the house at HauteDish. Her management skills were evident the moment I walked in the door at Estelle’s. It was a near-full house – I lucked into the last seat at the bar – and the place was running like clockwork). Anyway, the Travail influence. The bowl arrives with a flurry of goodies at the bottom, included candied pecans, pint-sized sourdough croutons, soft caramelized onions, chewy black currants and snippets of that exceptional bacon. Not that this well-suited mélange is entirely visible; it’s blanketed by a cloud of, yes, cotton candy. “I have a cotton candy machine, so why not?” said Brown with a laugh. The spun sugar dissipates quickly, however, when a pitcher of silken squash soup appears and is poured into the bowl. The effect is not unlike the Wicked Witch of the West, when she’s doused with a bucket of water. But there’s the thing: for all that sugar, the takeaway is hardly sweet. The roasted squash, so supple and velvety, is touched with cream and butter but not overwhelmed by it, and Brown sneaks in a hint of Tabasco to end each spoonful on a spicy rather than sweet note. It’s a dizzying one-two punch; entertaining theatrics and skilled cooking. Travel notes: There are plenty of draws for Twin Cities daytrippers in Harmony and its surrounding countryside of rolling hills and stunning fall colors. Amish Tours of Harmony offer a glimpse into a world that’s far away from the hubbub of the Twin Cities. Nearby Niagara Cave is a peek into an entirely different environment. 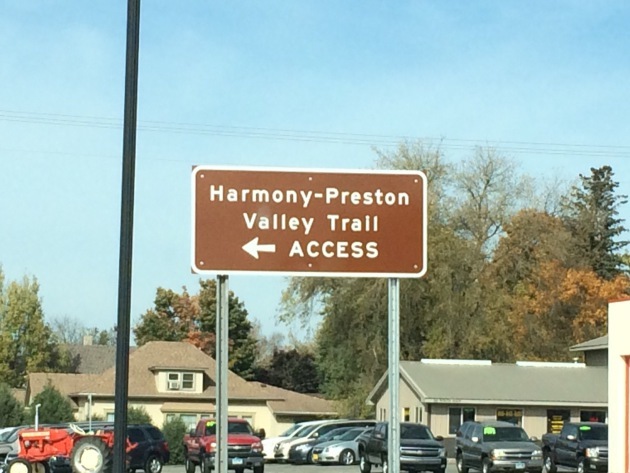 And the ultra-scenic, 18-mile Harmony-Preston Valley State Trail is a stone’s throw from the restaurant’s door. Who knows? It might be warm enough this weekend to enjoy lunch on the restaurant's patio. Address book: 121 Main Ave. N., Harmony, Minn., 507-886-1234. Open 11 a.m. to 9 p.m. Tue.-Thu., 11 a.m.-10 p.m. Fri.-Sat., 11 a.m.-8 p.m. Sunday (lunch served to 5 p.m. daily).